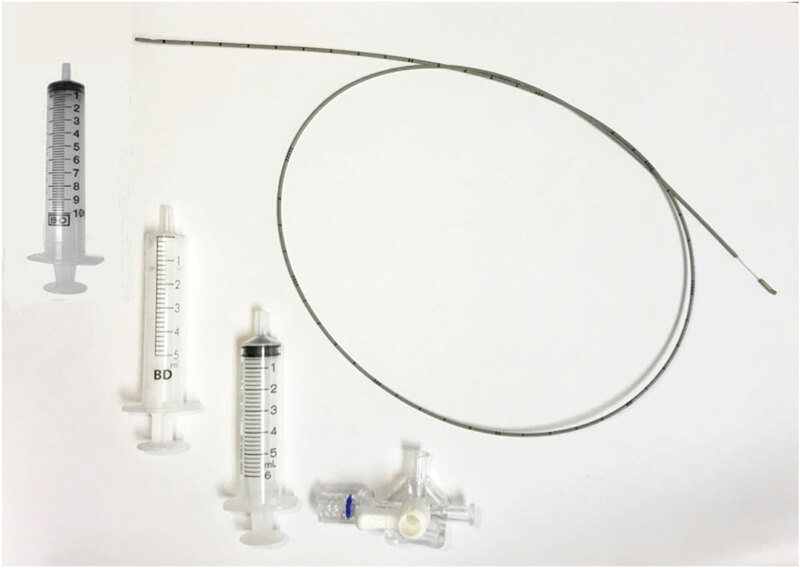 Techlamed purpose to Physicians a certified kit, named Cathfoam, composed by a centimetred catheter with closed tip and two side non-coaxial holes. 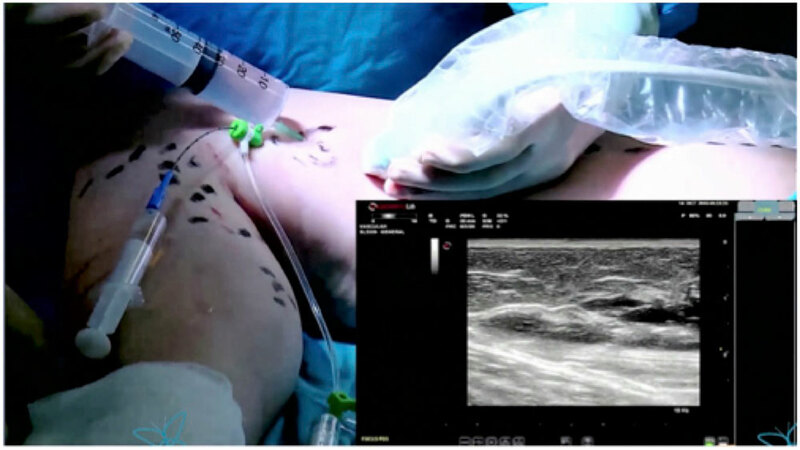 This system allow to practice sclerotherapy with high precision, using minimum quantities of sclerosant foam, to close completely the insufficient saphenous vein. After the vein cannulation, inserting the guide wire, then a 6 Fr. introducer. Remove guidewire. N.B. Access kit and introducer are not included in the Cathfoam kit. Open the package and extract the internal sterile Cathfoam kit, maintaining the sterile conditions. The guidewire is removed firstly, then the introducer’s stylet. The 4 Fr. Catheter is finally entered and advanced through the intravenous sheath, placing the catheter tip about 5 cm below the saphenous junction. 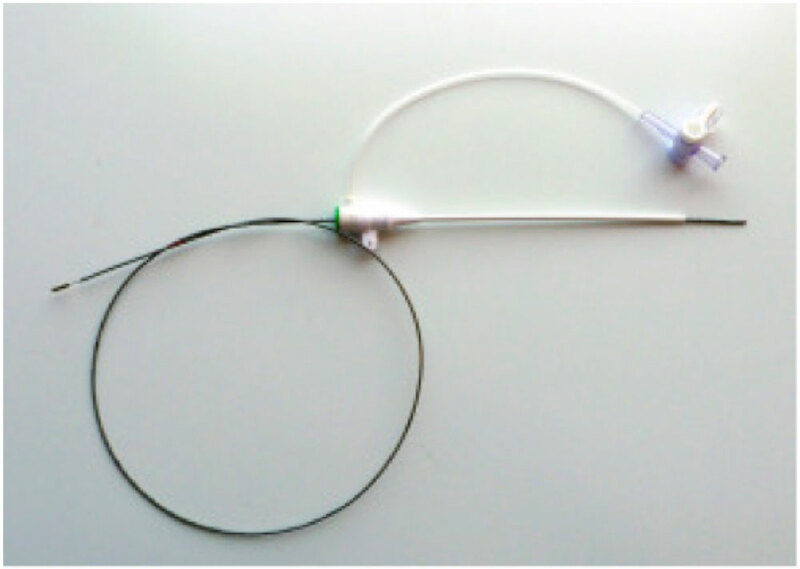 The intra-catheter guidewire is removed and the Fr.3-Fr.7 blue adaptor is attached to the catheter. The vein (saphenous) caliber is reduced by means of infiltration of tumescence solution in the perivenous tissues, inside the saphenous compartment (obtaining the complete squeezing of the targeted vein segment). Tumescence infiltration of the skin and subcutaneous tissues is performed also in the area of the introducer entrance and 5 cm below. A) Through the external valve and the washing tube connected to the sheath (hence blood is flushed away from the distal-median part of the vein). 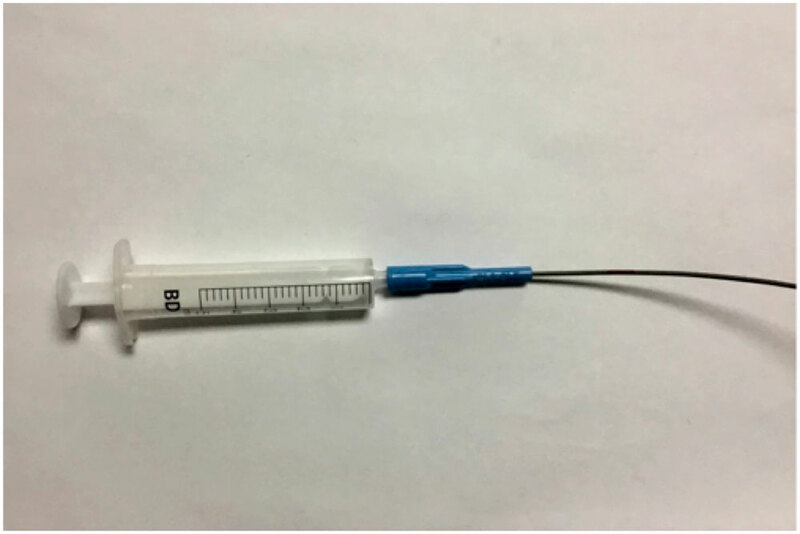 B) Through the blue adaptor inside the catheter and its tip, (hence washing away the blood from the proximal-median segment of the vein). 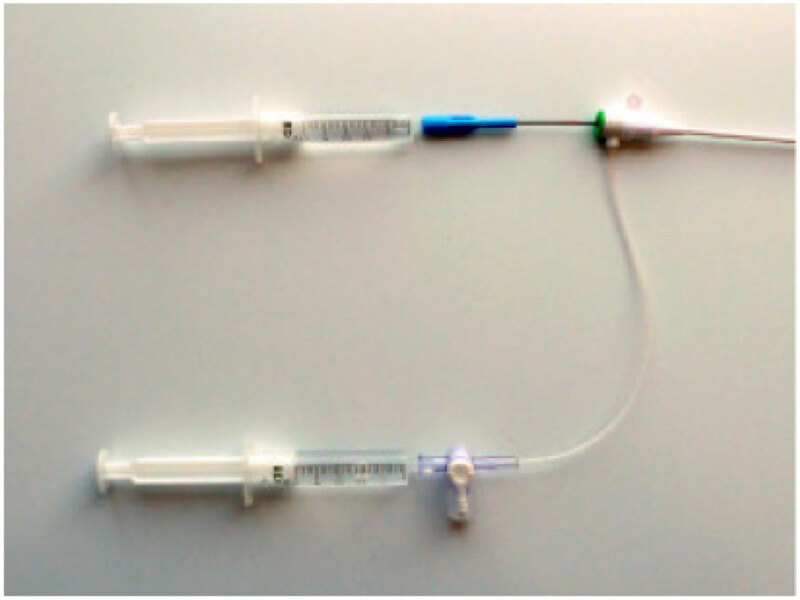 Prepare the sclerosing foam, using the sclerosing drug and gas, with the two syringes (one 5 ml and 10 ml) and 3-way valve provided. 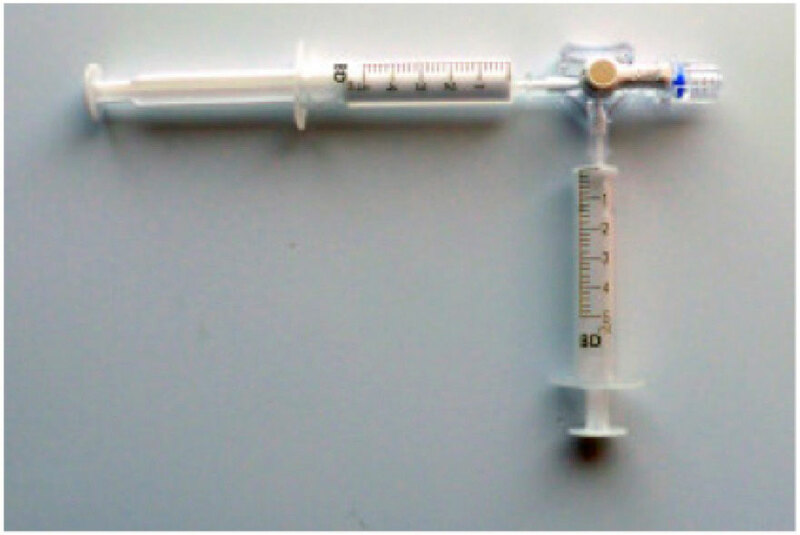 The freshly formed sclerosant foam is aspired inside the 10 ml syringe, which is subsequently connected to the blue adaptor. 1 ml of sclerosant foam is injected in the immobile catheter. Finally, the catheter is slowly retrieved in a continuous fashion, while injecting about 1 ml of sclerosant foam every 5 cm of treated vein. Once the catheter and the sheath have been removed from the vein, the entrance skin incision is flushed with saline solution furthermore; steri-strip suture is placed on the skin incision. 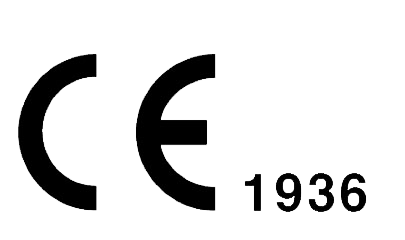 Compression (Stocking and/or bandage) follows.